WEST LAFAYETTE, Ind. 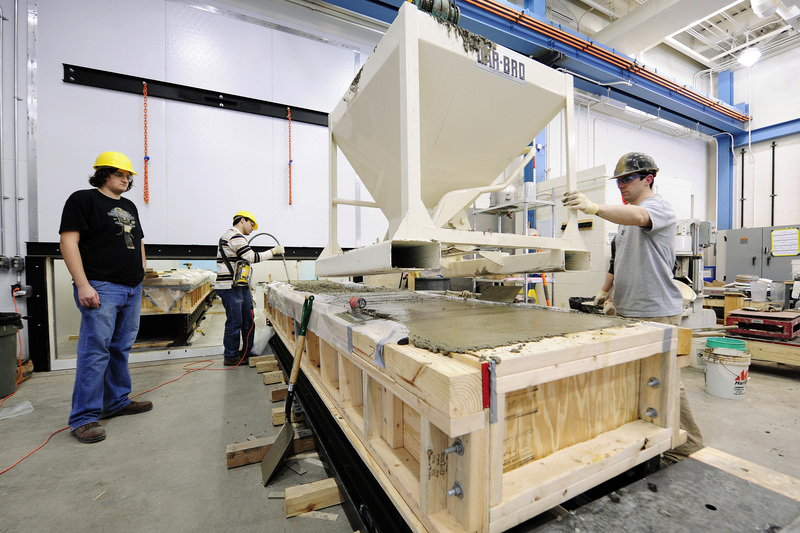 - Purdue University research is enabling Indiana to improve bridges in the state with a new "internally cured" high-performance concrete. "This material will reduce maintenance costs and allow bridge decks to last longer," said Jason Weiss, a professor of civil engineering and director of Purdue's Pankow Materials Laboratory. "Our testing indicates that internally cured high-performance concrete experiences substantially less cracking and concrete damage caused by deicing salt and, when properly designed, the service life of bridge decks can be greatly extended." The Joint Transportation Research Program, a partnership between the Indiana Department of Transportation (INDOT) and Purdue, worked with Weiss and INDOT to create specifications for implementing the internally cured high-performance concrete. It will be used on four bridges this year, the first of which will be on State Road 933 in St. Joseph County. "We anticipate these relatively minor changes to our concrete specifications to substantially extend the life of our bridges," said Troy Woodruff, INDOT's chief of staff. "That means fewer traffic delays due to bridge maintenance and repair, and much lower expense." Jay Wasson, INDOT deputy commissioner for engineering and asset management, said, "This collaboration between Purdue and INDOT to implement the research findings not only benefits Indiana taxpayers, but also provides valuable full-scale living laboratories for study by Purdue students and faculty. As further field data are collected by professor Weiss, we anticipate even broader deployment of this concrete specification." Concrete is normally made by mixing portland cement with water, sand and stone. In the curing or hardening process, water helps the concrete mixture gain strength by reacting with the cement. Traditionally, curing is promoted by adding water on top of the bridge deck surface. The new technology for internal curing provides additional water pockets inside the concrete, enhancing the reaction between the cement and water, which adds to strength and durability. The water pockets are formed by using small porous stones - or lightweight fine aggregate, as it is known in the industry - to replace some of the sand in the mixture. "A key step in the process is to pre-wet the lightweight aggregate with water before mixing the concrete," Weiss said. "Nearly five years of research has been performed to fully understand how to proportion these mixtures and the level of performance that can be expected." The researchers assisted Monroe County in the specification of internally cured concrete used in a bridge built in 2010. The researchers are studying how well it performs compared to an adjacent bridge built the same year using conventional concrete. "The control bridge has developed three cracks, but no cracks have developed in the internally cured bridge. Tests also show the internally cured concrete is approximately 30 percent more resistant to salt ingress," Weiss said. He has worked with several states in addition to Indiana to accelerate the use of similar internally cured high-performance concretes. The composition of high-performance concrete varies from state-to-state depending on which materials are locally available and the design of bridge deck components. The internal curing process also allows engineers to reduce the amount of portland cement used in the concrete by replacing a portion of it with supplementary materials, such as silica fume, fly ash and limestone. These supplements will reduce the waste stream, the need for raw materials and the carbon footprint of making concrete while improving its durability, Weiss said. "We just finished a project for the Federal Highway Administration where we showed that we can take 60 percent of the cement out of a typical bridge deck concrete and obtain similar if not better performance for bridges by taking advantage of the benefits internal curing provides," he said. Sponsors and contributors to the work include INDOT, the Joint Transportation Research Program, the Indiana Local Technical Assistance Program, the National Institute of Standards and Technology, Lafarge North America, and the Expanded Shale Clay and Slate Institute.